Excellent Clairemont location single story duplex home with spacious living rooms. 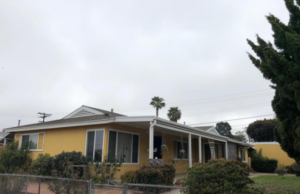 One unit fully remodeled, the second unit has a long-term tenant; it has newer flooring, a new refrigerator, new wall heater and window treatments. Upgrades include newer roof, gutters, dual pane windows. These are 2BR/1BA attached homes with washer/dryer in both. Each unit has it’s own single garage, there is one additional parking space and plenty of street parking. Fenced in common area and private rear/side yards. Plus easy access to freeways and shopping. Click here for more details, including additional photos of 4965-67 Coconino Way.